HydroTech over at The California Golden Blogs put out a reminder to treat the Tennessee fans well. As he put it: “Be Loud. Be Classy. Let’s send Tennessee home with a big L and a positive Pac-10/Cal experience (except for the losing part).” I couldn’t have said it better myself. I’d like to add an additional bit about representing Cal well tomorrow in regards to a different group: The Tree Sitters. The last thing any of us need is an embarassing scirmish, either verbal or physical, caught on film (and as can be seen from their litany of YouTube videos, they love to video tape stuff). There’s no reason to engage these people. You may think that you’ll be advancing the cause of Cal Football, but you won’t be. These people thrive on attention and conflict. You can do nothing better than to ignore them. It’ll anger them more when you walk away and dismiss them than if you argue with them. They’ll do everything in their power to get you to engage with them including insults, taunts and other forms of verbal abuse and physical confrontation. Don’t take the bait. Take the high road. Not only will you prevent being the cause of any bad PR you’ll also strike a blow to their cause because as I said, they hate nothing more than being ignored. I don’t know what happened in mid-July but the seemingly interminable off-season that refused to go quietly into the desert night (can anyone guess the movie reference for that one?) suddenly turned into a mad-rush for opening day. I went from thinking I needed to come up with some good blog content to tide me over from when the 2006 lookback series ended until when the season started to finding myself barely able to keep up with all of the breaking news amidst a very personally busy August. It’s unbelievable to me that it’s already time for my Tennessee game preview. I don’t know how it is possible but I think there is more emotion surrounding this game than there was last year. Last year I feel that us Cal fans overlooked Tennessee. This was a team that was 5-6 the previous year and past its prime. We all know what happened. If anything, the tables are almost perfectly turned around this year. Tennessee is the team on the road. Tennessee is the team with the new cornerback to break in. Tennessee is the team that may be over-confident thinking that no Pac-10 team can compete with the SEC competition they deal with week-in and week out. About the only thing that isn’t reversed from last year is the betting spread and the team rankings which are surprisingly similar to last year with the lone exception of Tennessee being a handful of spots higher in the polls, although still trailing Cal. I’ve repeated over and over my contention that last year’s game was tighter than everyone remembers. My opinion on that has only gotten stronger in the build up to this year’s game. I’ve heard statements that can’t possibly be justified. Things like there are supposedly Cal players who can’t even get through watching the 1st quarter of last year’s game (um… the score was only 7-0 at the end of the first). It seems that every reporter is besides themselves trying to come up with new and more colorful ways to state that the game was a ridiculous blowout “despite the final score”. What continues to boggle my mind is that these same reporters go on to predict that Cal will win this year. I’m sorry, that’s just not logically consistent. These teams have just not changed that much to justify saying last year was a horrific blowout where Tennessee displayed its vastly superior talent but this year Cal is going to win. So we’re left with two possibilities. One, this year is going to be another painful reminder that Cal, although very good, just isn’t where the elite programs are. Or two, Cal is going to impress a lot of people, even if they lose. I don’t know why, but I get the distinct feeling that these same reporters who remember the… I need a new qualifier… um… DISASTEROUS blowout and at the same time are predicting Cal to win this year don’t really in their heart of hearts expect Cal to be able to compete with Tennessee. They’ll actually be surprised if Cal wins in the fashion they’re stating that Cal will in their articles. It’s odd, really odd. Personally, I think Cal has the talent to win this game in a blowout fashion particularly with good use of misdirection to keep the Tennessee defense off balance, particularly if Tennessee comes in over-confident. That said, I don’t think that it’s going to go down that way. I think that this game is going to be a grudge match for the ages. Tennessee will likely come into the game a little flat and a little rattled by how hard Cal is playing them and how loud the crowd is. Cal on the other hand will come in looking to prove themselves and get… it’s time to play pick that ‘R’ word… redemption, revenge, retribution, retaliation, reprisal, repayment, etc., for last year’s HUMILIATING blowout. And while that’ll set the tone for the first couple of drives, I expect Tennessee to rebound and play some of the toughest football they’ve ever played. Tennessee will get beat deep once: I don’t expect this to happen early. Tennessee is going to keep a safety on DeSean all game. But as Forsett establishes the run attack, that 2nd safety will get pulled in too far and either Hawkins or Jorden will get behind their corner for an easy TD. I expect those safeties to make at least one mistake. >Forsett will shine late in the game: Every time he’s started he’s worn down defenses with his speed. I expect a tired Tennessee defense to be unable to slow our run attack late in the game. Tennessee’s running game won’t miss a beat: All the controversy surrounding the player suspensions will amount to nothing. Tennessee’s no-huddle will be a think of the past by the 2nd quarter: It’ll be a fun experiment for us Cal fans to “explain” why it doesn’t work on the road. Cal will have difficulty getting pressure on the QB: While I feel pretty good about the Cal defense’s ability slow Tennessee’s offense both in the secondary and in the run game, the secondary’s job will not be made easier by the D-Line. OK, to sumerize: Cal will come out strong early and get a lead. Tennessee will make in-roads on that lead in the 2nd half but the Cal defense will step up and play some very physical football and Forsett will run out the clock effectively after wearing the Tennessee defense down to help Cal hold on to their lead. Final score – Cal: 23, Tennessee: 20. 2007 Season Preview – version 2.0! Cal 23, Tennesse 20: In a game that was not as close as the final score, Cal is able to rebound from a couple of painful defensive mistakes. Unlike last year, not all of those mistakes go for touchdowns, but do result in about 10 unearned points. Cal will come out of the tunnel pumped and ready to play while Tennessee will come out flat and over-confident. The crowd will be a huge factor both in getting the Cal players pumped up, getting Tennessee rattled in their no-huddle early in the game. Those defensive mistakes will open the door back up, but Cal will stop them flat. Change from Spring: Adjusted score down based on Tennessee’s defense seeming to gel. Cal 38, Colorado St. 13: In a game that is reminiscent of the mid-2006 season, Cal wipes the floor with a Mountain West team that continues in its struggling ways. Change from Spring: Dropped score slightly because… well… I felt like it. Cal 35, Louisiana Tech 17: In a game that is never in doubt, but one where Cal looks surprisingly vulnerable, Cal manages to win despite looking shakey. This one feels like the 2006 win over UCLA, somehow not inspiring despite the good outcome/score. Even though there was no reason to think Louisiana Tech would put up any more of a fight than Colorado St., Cal looks like they may have taken them for granted and was looking forward to their revenge game against Arizona the following week. Change from Spring: Increased winning margin a bit based on Cal’s strong play in fall ball on both sides. Cal 24, Arizona 10: In a generally low scoring game, Cal manages to get their revenge for the 2006 upset over the now 2-2 Arizona Wildcats (their other loss to BYU). Generally, the Cal defense looks the best it has all year as the Arizona offense continues to struggle in Berkeley. On the downside, the Arizona defense continues to keep the Bears in check and the game is closer than Cal fans feel comfortable with. Change from Spring: Lowered Arizona score based on better feeling about Cal defense. Cal 31, Oregon 24: Cal will similarly demoralize the Oregon Ducks like it did in 2006 and will lead this game 28-10 going into the 4th quarter. Unlike 2006, Oregon who already has one loss to Michigan and a tight game versus Fresno St., with its fans behind it, manage a strong 4th quarter with two TDs to end with a respectable score. Nevertheless, the game will have a â€œCal-Tennessee blowoutâ€ feel to it and Cal will get lots of props for the big win and will be rising in to the polls, into the middle of the top 10. Change from Spring: No change. Cal 21, OSU 16: In a highly billed and nationally televised Pac-10 showdown of undefeated teams, a defensive struggle that is frustrating to Cal fans for itâ€™s lack of offensive fire-power, results in Cal squeeking out a victory in a game where it scores fewer times than its opposition. Despite the fact that OSU came into the game undefeated because of upset wins over ASU on the road and an over-rated UCLA at home, Calâ€™s defense proves too confusing for OSUâ€™s young QB. On the plus side, the victory can be given to the stout defense that kept OSU out of the endzone including an important mid-4th quarter goal-line stand that will have OSU fans questioning why their beloved Beavers didnâ€™t go for it on 4th down with that little time left and the potential to tie with a touchdown and two-point conversion. Calâ€™s ability to beat an undefeated team catapults it into the Top-5. Change from Spring: Increased score for OSU after their strong performance last night and probably over-rating their defense in the spring. Cal 24, UCLA 13: Cal FINALLY wins one at the Rose Bowl upsetting the biggest home-field advantage for a Pac-10 matchup (neither road team has won this game since 1999, a 17-0 Cal/Holmoe (go figure) win in LA). The game ends up being the death-noll for a UCLA team with high expectations, it being their 3rd loss of the season (BYU and Oregon St. being the other two), as they sink into mediocrity despite having beaten Notre Dame at home the week before in a revenge game for them after the 2006 collapse in South Bend. Change from Spring: Adjusted score way down. This isn’t going to be a shootout… I don’t know what I was thinking. Cal 31, ASU 17: Cal gets through the last of its troublesome road games in a dominating win over a highly billed ASU team. ASU turns out to be a fraud yet again despite rising in the polls on their run to 7-1 (lost was to OSU). The problem wa that ASU hadn’t played anyone worth mentioning until the played Cal. ASU then goes into a tail spin losing at least 3 of their last for games (@Oregon, @UCLA, USC and Arizona). Cal maintains its spot in the top-5 and the Cal-USC matchup starts to get the kind of billing that the Ohio State-Michigan game got last year on ABC/ESPN. Change from Spring: Changed to a win and lowered ASU’s score dramatically. The rumors from ASU’s training camp seem to suggest that it is going to take Erickson more than a year to turn around ASU into the team they have the talent to be. Cal 31, WSU 10: Cal doesn’t overlook WSU and wins this one in a game where the score is never all that close, WSU continues their downward spiral into the Pac-10 basement at 2-7, only above Stanford. Their offense just can’t get the job done against an improving every week Cal defense. The younger Mixon brother, Terry, regrets the decision to go north instead of playing for his older brotherâ€™s school. Change from Spring: Adjusted Cal’s score up slightly. Cal 20, USC 21: In one of the biggest heart-breakers in Cal football history, undefeated USC comes into Berkeley and beats the Bears in a very, very tight game. Cal will make one too many mistakes in a game where it was clear that Cal could have won, similar to 2004 down at the Coliseum, but just didnâ€™t play consistently enough to get the job done. USC continues on as the #1 school in the country on their way to a national championship. Nevertheless, Cal holds onto a top-10 poll spot because of the tight game that has pundits around the country saying good things about Cal, despite the loss. After the pain of the loss subsides just a bit, Cal fans keep their vomit down as they root for USC to finish out undefeated clearing the way for a Cal Rose Bowl. Change from Spring: No changes. Cal 31, UW 13: Poor UW. Theyâ€™re wallowing in misery late in a disappointing season with very little talent. Theyâ€™re very much like the 2005 Stanford team that managed more wins than anyone expected through discipline and good coaching. Nevertheless, although theyâ€™ve managed 4 wins (Syracuse, Oregon, Arizona, Stanford) and still had a shot at a bowl game coming into their home game against Cal, there is just too much talent on the visitorâ€™s sideline and they go down fast and easy in the first half, ending their bid at bowl eligibility. Change from Spring: Adjusted Cal score down because of increased weather concerns. Cal 37, Stanford 6: Stanford gives up their last shot at a Pac-10 win early in this blowout of epic proportions giving Cal its 6th Big Game victory in a row. In the end, Calâ€™s desire to impress the Rose Bowl committee combined with their superior coaching and talent were too much for Stanford despite their determination to get a conference win before their season comes to an end. They end the season 1-11, their only win being an uncomfortably close home game against San Jose St. in week 2. Change from Spring: No changes. Cal 31, Michigan 17: In their first Rose Bowl since 1959, Cal crushes a vastly inferrior Michigan from the quickly losing respect Big-10, despite â€œsneakingâ€ into the spot via USC going to and winning the National Championship game. The victory over Michigan, not Wisconson as many pundits suggest because, just like many overhyped â€œalternativeâ€ Big-10 teams, they couldnâ€™t beat either Ohio State or Michigan, finishing the season 10-2. Ohio St. loses a couple of painful games to Penn State and Michigan to put them out of the running despite their powder puff non-conference schedule with Youngstown St., Akron, Kent, and their only non-conference opponent with anything resembling teeth, Washington. With the big Pac-10 wins over the SEC (Cal over Tennessee, USC over Florida or LSU) the SEC, who should have been forced to eat their words, instead complain about how beat up they get and how hard it is to bring their ‘A’ game each week. Change from Spring: Turned into a win after looking at how weak both Michigan and Big-10 look. While I feel like my predictions got more homer-ish from the spring, I think that there are lots of reason to be VERY optimistic about this season. I think we’ll know everything we need to know by tomorrow at 6:00 PM. As many of us hoped and expected, Judge Miller rejected the protestor’s ill-founded request to have the fence removed. What was mildly surprising was that she ruled more quickly than she had originally indicated, doing it on Thursday evening, only a handful of hours after hearing arguments. Clearly after looking over the evidence she didn’t need to spend the night thinking it over. While after reflection I’m not so sure the fence was a good idea (brings to much attention to protestors), particularly at this late date, I do know that the ruling is very good news. It’s an indicator that we have a judge who rules based on the law, not based on some ridiculous emotional pleas and twisted-logic appeals to over-applied aspects of the Constitution. It also will probably have the effect of lighting a fire under the City of Berkeley to make a settlement with the University. The more and more evidence there is that the judge is going to rule in the University’s favor, the more and more likely it is that the COB has to settle if they want to get any concessions. Speaking of which, the word on the street is that the COB and the University have been having closed door negotiations this week and that a settlement is likely. No word on an expected timeline. This just in: At 1:30 this afternoon (8/30) Judge Miller heard an hour’s worth of argument about whether this new fence breaks the injunction. At the end of those arguments she indicated that she’ll give a ruling within 24 hours. To me that means tomorrow morning, tomorrow mid-day at the latest. In any case, I suspect this is a just a judge thing that they don’t rule on anything right away (probably because it would give the appearance of already having had made up one’s mind). I will say this: if she rules in favor of the tree-sitters, I’ll be VERY VERY VERY VERY VERY worried about the actual case later in September. YouTube video produced by Tree-Sitter support group(note that you’re going to hear a LOT of bad language). Things are a lot more nasty there than I thought or understood from the articles on the subject, although to some degree they’re showing the 30 seconds of a scuffle amongst hours of people sitting around doing nothing. The videos also give the best pictures of the nature of the fence. I keep going back and forth. Now I’m thinking they’re not very stoutly put in the ground. That fence was swaying all over the place and without much force. A tightly strunk (and hence well anchored) fence wouldn’t do that. No word yet on the request to block the fence in the Alameda county courts. There are a lot of definitions of the word temporary. Personally, I think the fence installed around the Oak Grove stretches the definition. (You can see some pictures at these two articles: Scout and SFGate). I would not consider a chain-link fence with poles that have been pounded in the ground and takes over a day to install “temporary”. It even looks as though it will be topped with some sort of barbed wire. About the only thing one could do to make it more permanent is to pour concrete pilings for the posts. This is all of course good news. The more stout and permanent the better, I say. One last note, it seems unclear on what the police policy is going to be on the passing of supplies to the tree-sitters. While e-mail communication from the University seemed to make it clear that they wouldn’t interfere, according to the articles, the police have been arresting those who have tried to pass supplies to the tree-sitters even when they are ourside the fence barrier. Perhaps they’re not going to take any guff while the fence is being constructed, but once it is, they won’t be on a 24-hour watch. It could also be that there is a lack of communication between the officers on site and the University plans. Of course I’m all for cutting off all supplies, but I think clarity on the policy and it being caried out as stated is important as well. There’s no reason to give the protestors any ammunition to work with. UPDATE: It appears the protestors are going to try and get an injunction against the fence today in court. Come back later today for updates. In a stronger move than I would have expected, this morning the Berkeley police put up a fence around the trees where the tree-sitters are wasting their lives away. I’ve not been able to get a hold of any pictures of the fence so I don’t know what kind of fence we’re talking about. Is this one of those VERY temporary fences that can’t even be climbed because they fall over from the weight? Or is it something that is staked into the ground? I think that makes a big difference as to what kind of impact it’ll have. The tree-sitters are of course moaning about this, saying it violates the court injunction with their usual dubious legal logic. They also say that this is a way to “starve” the protestors out of the trees. Somehow I doubt this will be the case because I can’t imagine a fence they could build in a day that could prevent the passing of supplies when no one was looking (and I doubt the police are planning on a 24-hour watch). My guess is that this is a “protest barrier” to prevent incidents at the games and not much more. Perhaps it is a move to prevent more protestors from moving into the trees, although, again, sans a 24-hour police watch, I don’t see how they can effectively do that. If anything it’ll do more to protect the protestors from angry fans than harm them with the possible exception of not allowing their on-the-ground protest at the games to be as cohesive as it would be. I’ll post pictures if I can find them. This morning a temporary barrier was placed around the trees that are currently occupied by protesters. Based on the UC Police Department’s analysis and recommendations we decided that this would be a necessary and prudent step to ensure the safety of game-day fans and the protesters. We must emphasize that this is not in any way part of an effort to forcibly remove protesters from the grove. We have reluctantly accepted their unauthorized presence since last December, and while we will continue to evaluate that policy of tolerance we expect it to continue until the lawsuits are resolved. I was asked by sportprojections.com to write the preview for the Cal Bears for 2007. Here is the preview. Interesting to note is that Cal got a 1st place vote and it wasn’t for me. I wasn’t going to be the Homer that the UCLA guy was and pick my own team against the concensus of the rest of the pundits out there. But the Arizona contributor thinks highly enough of the Bears to give them their lone 1st place vote. That’s a first place vote worth getting. Tedford loves to keep the QB decision close to his chest, there’s no question about it. But at some point, he’s got to pick who’s going to the snaps during practice, forcing his hand. That’s what happened yesterday as Riley started taking all the 2nd team snaps. Tedford insists that it doesn’t mean much for next year or even later in the year should Longshore go down with a multi-week injury. While that may be true in principle, if Riley ends up getting many snaps behind center during games this year, it’ll make him the logical choice for full-time duty later. So in my opinion the best way to tell where Riley and Reed sit for future full time duty is to see what percentage each of them gets in mop-up or other backup duty to Lonshore. Some pontificators are concerned that because Riley is the younger of the two QBs, Reed may be looking for a transfer. It’s hard to say for sure and it may be why Tedford continues to keep his cards close to his chest but personally I’m not too worried about it. If he’s going to leave, he’s going to leave. We’ve got plenty of depth at QB and its better to let the young man do what he thinks is best for himself than pressure him into doing something that may not benefit either himself or the team. The backup quarterback position still looks no more resolved than it did a week ago. If anything it’s more up in the air as Tedford has added Bryan Van Meter name to the list of possible backups. Van Meter is a junior and has been mostly overlooked ever since Longshore established himself as the best QB in 2005. When Longshore got hurt and “Booya backwards” took over, it cemented Van Meter’s spot in the back of people’s memory banks. Tedford definitely threw a wrench in everyone’s expectations by bringing his make into the discussion. Two starters have been named on the defensive line. Rulon Davis got the spot many were thinking he’d take on the inside and Tyson Alualu although written in ink as a starter is only penciled in on the inside. Mika Kane, Tad Smith and Cody Jones look to be fighting for that last starting spot but will likely get plenty of playing time during the season as the coaching staff indicated that they will be rotating players in and out more this year. Overall things are looking up on the defensive line. Along those lines, the defensive line has impressed some with their ability to get into the backfield, particulary in scrimages. From my vantage point I’m not sure if that’s a positive for the defensive line or an indication that the offensive line hasn’t gelled yet or is weaker than we fear. Generally speaking, its been very quiet on the news front for the offensive line. Again, I’m not sure if that’s a good or a bad thing. Speaking of scrimages, to date the offense has been the better of the two units. This is really no surprise. Although it is to be expected, the list of injuries continues to grow. The biggest hit is that starting fullback Will Ta’ufo’ou is going to be sidelined for about a month with a knee injury (MCL). It’s particularly worrisome because his backups, Brian Holley and Zack Smith, are pretty fresh and how long it can take knee injuries to heal. Most of the other injuries have either been minor in nature or to players that don’t figure into the mix much. On the depth plus side, this year looks to have the highest number of true fresmen who won’t redshirt in Tedford’s tenure. As many as five will be playing this year including running backs Best and Shane Vareen, defensive end Cameron Jordon and cornerback Chris Conte who started in Syd’Quans spot as he sat out a day for a minor injury. Finally, speaking of true freshmen, Jahvid Best continues to impress. His teammates have been calling him Jahvid the Jet and the coaching staff continues to rave about him making all of the comparisions to Lynch and even Reggie Bush that raise people’s eyebrows. Hampton looks to be 2nd corner: Not much of a surprise really. With 3 talented safeties (DeCoud, Hamption and Hicks) and at least one backups with talent (Peele), it seems prudent to move one over to corner. It sounds like the youngin’s Brandon Jones, Charles Amadi and Darian Hagan just aren’t ready. True Freshman Jadvid Best is special: With two talented redshirt freshmen running backs competing for the #2 spot behind Forsett (Montgomery and Slocum) it’s surprising just how much press Best is getting. He looks to be something special and may just have what it takes to be the #2 back… well… at least by midseason. We all know how tough it is for new players to understand the complexities of the Tedford offense. For now, Montgomery seems to have the inside track on the #2 spot. Jackson returning kickoffs: During special teams practice, DeSean has been back to return kickoffs. This has been speculated about a great and it looks like it’s a strong possibility. Backup QB still up in the air: Both Riley and Reed have had their ups and downs during practice and neither have particularly shined. It’s further proof that likely the worst thing that can happen to the bears is a Longshore injury. Defensive line still troublesome: With Derrick Hill coming into camp out of shape and Phillip Mgakogu being sidelined for a second season with knee problems, the defensive line looks to be the weak spot this year although it’s too early to count out the current starting four of Tad Smith, Cody Jones Matt Melele and Tyson Alualu… there’s definitely talent there. Linebackers continuing to impress: Williams, Follett and Felder have all gotten mentions for their strong play and the unit as a whole looks both both strong and fast, as well as deep. Everyone’s favorite Cal running back, Marshawn Lynch, took to an NFL field for the first time this weekend against the New Orleans Saints. The guy who sits behind me at Memorial Stadium always used to shout, “Attababy, Marshawn!” after every long carry made by Lynch during his years at Cal. I’m gonna miss that. But I’ve got the NFL Sunday Ticket package, so I plan on shouting it myself every so often during Bills games this year. After the Chargers and… 49ers (he said tentatively, afraid of being betrayed once again by the foolish York family), the Bills will be one of the NFL teams I’ll be watching closely this year. Unfortunately, I’m in a fantasy football league dominated by Cal fans, so there’s no way that Lynch won’t be anything except hideously overpriced. In a weak outing by the Bills offense, Lynch had two carries for three yards. I’m still pretty positive about Lynch’s future in the NFL, but it would be nice to see him break a few during the pre-season. I’m sure Bills fans are looking forward to it too. I mean, Anthony Thomas? Come on, Buffalo. You can do better than that. Posted on on August 12th, 2007 in Player News | Comments Off on Attababy, Marshawn? Hi, I’m Jason Snell, and I’ve been known to obsess about Cal Football. 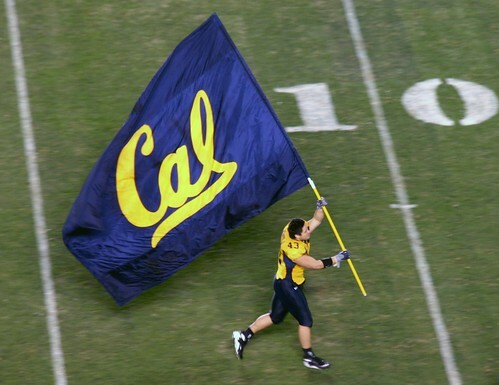 I’ve been blogging about Cal Football for a few years over at Sturdy Golden Blog and Ken and I thought we’d try to join forces and see how the shoes fit. The short version of my bio: I’ve been going to Cal games since I was a little kid. My season tickets, in section FF, are the same seats my family has had since I was little. My dad has been a Cal football fan and season ticketholder since the mid-’60s, and he brought me up right. Roger Theder? Saw him coach. J Torchio? Saw him be not a very good QB. The Play? We stayed home because the weather looked bad. But I listened to it live on the radio in my bedroom. In my professional life I’m an editor for a magazine and web site. Anyway, I’m happy to join forces with Ken and contribute to Excuse Me For My Voice. I hope you’ll all become regular readers of this blog during the football season. It’s a whole new site, with a whole bunch of new information. Please answer the poll question on the right about whether you like the new site. Any suggestions for improvement are welcome in the comment box.